Honoring the roots of the classics is a noble mission to undertake. Discovering a cohesive way to pay homage to the past while still remaining contemporary and distinct seems to be something very few explore. In Eric Marlin’s If the Saints Arrive in Germany, a parish in Germany lead by nuns receives word that their church will be soon be overrun and destroyed by religious opposition. In their final hours, the women of devotion each prepare to honor their faith. Marlin’s play was strong in plot execution but desired immensely on character development. While the story was unfolding, we didn’t quite get to learn much about who these women were. There was the occasional glimmer of character backstory, primarily between Sister Elizabeth and Sister Friede, but it occurred much later after we had met them. Currently with a nice running time, there is room to grow and develop these intriguing women. When you know more about the characters you’re watching, the better the chance of sympathy. One of the larger hiccups was the stakes seemed to be lacking. Yes, it was very clear that disaster was immanent, but the pacing of the characters within their scenes appeared lackadaisical until the first physical sign of ambush. A simple sound cue of the hourly bell chime between scenes could have easily aided to raise the stacks, allowing for the desired breath to occur. The ensemble of six was a cast divided. There appeared to be two very different stylistic choices presented. It was almost a mix of between the dramatic nuns of The Sound of Music blended in with the colorful caricatures of “Sister Act.” Sarah Lusche and Molly O’Keefe as Sister Isla and Sister Katrin offered the comic relief of the play, however were on the opposite side of the spectrum from Heather Cadarette, Sarah Robotham, and Josephine Wheelwright, with Melissa Harlow serving as the style bridge gapping the two together. Lusche and O’Keefe’s characters were the literary clowns of the piece. Their performances were fun and likeable, but they seem to contradict the style and world of the play. Josephine Wheelwright’s strong yet compassionate Abess was a perfect blend of authority and confidant. 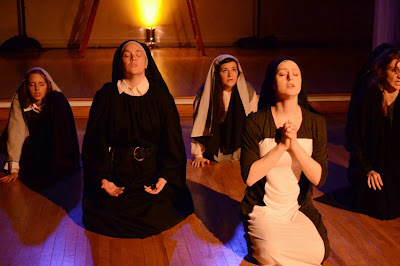 Heather Cadarette as the ailing Sister Antonia worked through her illness, offering one of the truer performances. Director Rebecca Wear handled the challenges presented to her to the best of her abilities. Being physically in a church was both a benefit and a hindrance to the production. The natural aura of the atmosphere added a beautiful level to the world of the play. You felt present with the sisters. With that being said, the acoustics of the space prevented audibility throughout the piece. Depending on your seat, there were moments where you would potentially lose pieces of text due to actor placement. Additionally, the blurred lines of the time period were tested with Melissa Bondar’s set. The use of ladders was surprisingly more jarring than initially expected. While they did had levels to the space, the bold colors screamed a different time. Despite the logistics of the play, this is not a piece about religion but about faith and how we as individuals believe. In that respect, If the Saints Arrive in Germany is a successful work. In time, this play has potential to soar.